FBI agent Emma Sharpe has a strong background in fine art recovery. Her family is renown for investigating and recovering stolen pieces of art. But she ends up involved in a murder and missing art investigation because she had also once been close to taking vows to become a nun. One of her mentors at the Sisters of the Joyful Heart convent asked Emma for a favor. Could she look at a piece of art and give her opinion? Without any further information, Emma returns to Maine to meet with Sister Joan. But instead of a simple art evaluation, she finds that Sister Joan is dead and a painting assumed to be from a local artist has disappeared. To complicate matters, a local priest has asked his friend, Colin Donovan, to keep an eye on Emma. Father Finian is new to the parish. His motives for asking Colin for help are not entirely clear, but Colin agrees. He’s in the middle of some needed rest & recuperation time (trying to keep the Russian mafia off his tail), but willing to take a side trip to help the attractive FBI agent with her case, whether she wants his help or not. Colin also works for the FBI, but not at a desk job as his family assumes. He goes deep undercover and investigates the worst of the FBI’s most wanted. He wonders if the murder could be related to his latest case. Emma thinks it is mostly annoying to have this other agent follow her footsteps. She can’t even continue her investigation in Ireland without Colin and Father Finian showing up. Is anyone who they seem to be on the surface? 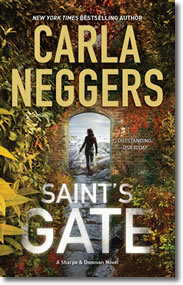 Carla Neggers writes well-paced, plot-based stories. There are plenty of details building characters and their backgrounds. And there’s a little romance, always a plus for me. It may not be convenient and it certainly doesn’t get in the way of the job, but Colin and Emma are definitely attracted to one another. The story comes to a satisfying conclusion to both the romance and the mystery of the missing painting. If you enjoy Saint’s Gate, check out Heron’s Cove, which continues Emma and Colin’s crime-solving partnership. Hi, are you doing a Best Books of the Year blog post this year? Thanks — yes, we’re currently working on the Best Books blog. Stay tuned!